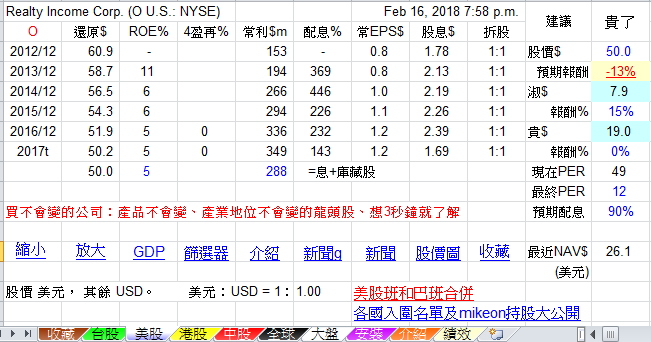 房地產投資信託 (REIT) - 舊討論區 - 巴菲特班 洪瑞泰 (Michael On) - Powered by Discuz! Ascendas Real Estate Investment Trust (A-REIT) is a real estate investment trust. The Company has a diversified portfolio of approximately 100 properties in Singapore, approximately 30 properties in Australia and approximately three properties in China. The Company's segments include Business & Science Park, Hi-Specs Industrial, Light Industrial, Logistics & Distribution Centres and Integrated Development Amenities & Retail. The Company's properties host a customer base of over 1,470 international and local companies from a range of industries and activities, including research and development, life sciences, information technology, engineering, light manufacturing, logistics service providers, electronics, telecommunications, manufacturing services and back-room support office in service industries. It is managed by Ascendas Funds Management (S) Limited (AFM). American Tower (NYSE: AMT) is a leading independent owner, operator and developer of wireless and broadcast communications real estate. Our global portfolio includes approximately 149,000 sites and is experiencing steady growth. In addition to leasing space on towers, we provide customized collocation solutions through our in-building systems, outdoor distributed antenna systems and other right-of-way options, managed rooftops and services that speed network deployment. Headquartered in Boston, Massachusetts, American Tower has offices across the United States and in Argentina, Brazil, Chile, Colombia, Costa Rica, France, Germany, Ghana, India, Mexico, Nigeria, Paraguay, Peru, South Africa and Uganda. American Tower Corporation is a publicly held company, owner and operator of wireless and broadcast communications infrastructure in several countries. American Tower is headquartered in Boston, Massachusetts and has local offices worldwide. The company was formed in 1995 as a unit of American Radio Systems, and was spun off from that company in 1998 when that company merged with CBS Corporation. Following the merger, American Tower began international expansion by establishing operations in Mexico in 1998 and Brazil in 1999. The company is structured as a real estate investment trust. In 2005, American Tower merged with SpectraSite Communications, Inc., expanding its global portfolio to over 22,000 owned communications sites including over 21,000 wireless towers, 400 broadcast towers and 100 in-building DAS (Distributed Antenna System) sites. The merger further established American Tower’s position as one of the largest tower owner and operators in North America. Between 2007 and 2012, American Tower’s international growth continued with operations in India, Peru, Chile, Colombia, South Africa, Ghana and Uganda. In 2013, American Tower acquired its smaller rival Global Tower Partners for 4.8 billion. This acquisition added sites to their U.S. portfolio and added operations in Costa Rica and Panama. Currently American Tower owns and operates over 100,000 sites in 13 countries. Soon after American Tower was founded, the company began purchasing numerous AT&T Long Lines microwave telephone relay towers. Upon acquisition of these sites from the now defunct AT&T Communications, Inc., American Tower began repurposing the towers for use as cell towers, and leasing antenna space to various American cell phone providers and private industries. Then, most of the former AT&T Long Lines sites had their horn-reflector antennas removed, either by helicopter or by crane, to make room for more antennas. Since AT&T's Long Lines Program was decommissioned in the 1980s, and the company no longer had any use for the towers themselves, American Tower now owns most of these tower structures across the entire continental United States. The picture below depicts a former AT&T Long Lines microwave radio relay tower, now repurposed by American Tower Corporation. American Tower Corporation (ATC) is a holding company. The Company operates as a real estate investment trust (REIT), which owns, operates and develops multitenant communications real estate. ATC's segments include U.S. property, Asia property, EMEA property, Latin America property, Services and Other. Its primary business is property operations, which include the leasing of space on communications sites to wireless service providers, radio and television broadcast companies, wireless data providers, government agencies and municipalities, and tenants in various other industries. Its U.S. property segment includes operations in the United States. Its Asia property segment includes operations in India. The EMEA property segment includes operations in Germany, Ghana, Nigeria, South Africa and Uganda. The Latin America property segment includes operations in Brazil, Chile, Colombia, Costa Rica, Mexico and Peru. Its services segment offers tower-related services in the United States. AvalonBay Communities, Inc., an equity REIT, has a long-term track record of developing, redeveloping, acquiring and managing distinctive apartment homes in some of the best U.S. markets, and delivering outsized, risk-adjusted returns to shareholders. With equal parts experience and vision, we’ve established a leadership position rooted in building value for the long term. AvalonBay Communities, Inc. is a publicly traded real estate investment trust that invests in apartments. As of January 31, 2017, the company owned 75,038 apartment units, all of which were in New England, the New York City metropolitan area, the Washington, D.C. metropolitan area, Seattle, and California. AvalonBay Communities, Inc. is a real estate investment trust (REIT). The Company is focused on the development, redevelopment, acquisition, ownership and operation of multifamily communities primarily in New England, the New York/New Jersey metro area, the Mid-Atlantic, the Pacific Northwest, and Northern and Southern California. Its segments include Established Communities, Other Stabilized Communities and Development/Redevelopment Communities. As of June 30, 2017, the Company owned or held a direct or indirect ownership interest in 287 apartment communities containing 83,123 apartment homes in 10 states and the District of Columbia, of which 23 communities were under development and nine communities were under redevelopment. It operates its apartment communities under three core brands: Avalon, AVA and Eaves by Avalon. Its real estate investments consist of operating apartment communities, communities in various stages of development (Development Communities) and Development Rights. Simon is a global leader in the ownership of premier shopping, dining, entertainment and mixed-use destinations and an S&P 100 company (Simon Property Group, NYSE:SPG). Our properties across North America, Europe, and Asia provide community gathering places for millions of people every day and generate billions in annual sales. Simon Property Group, Inc. is an American commercial real estate company in the United States and the largest real estate investment trust (REIT). It is also the largest shopping mall operator in America. The company is a fully integrated real estate company which operates from five retail real estate platforms: regional malls, Premium Outlet Centers, The Mills, community/lifestyle centers and international properties. It currently owns or has an interest in more than 325 properties comprising approximately 241,000,000 square feet (22,400,000 m2) of gross leasable area in North America and Asia. The company is headquartered in Indianapolis, Indiana and employs more than 5,000 people worldwide. It is publicly traded on the NYSE under the symbol SPG and is part of the S&P 100. Simon Property Group has been the subject of several lawsuits and investigations regarding civil rights and discrimination. Simon Property Group, Inc. is a self-administered and self-managed real estate investment trust (REIT). The Company owns, develops and manages retail real estate properties, which consist primarily of malls, Premium Outlets and The Mills. Simon Property Group, L.P. (Operating Partnership), is the Company's partnership subsidiary that owns all of its real estate properties and other assets. As of December 31, 2016, the Company owned or held an interest in 206 income-producing properties in the United States, which consisted of 108 malls, 67 Premium Outlets, 14 Mills, four lifestyle centers, and 13 other retail properties in 37 states and Puerto Rico. As of December 31, 2016, it had redevelopment and expansion projects, including the addition of anchors, big box tenants, and restaurants, underway at 27 properties in the United States and it had one outlet and one other retail project under development. Public Storage built its first self-storage facility in 1972. Today it operates thousands of unique and diverse company-owned locations in the United States and Europe, totaling more than 142 million net rentable square feet of real estate. Its PS Business Parks interest adds another 28 million(approx.) rentable square feet of commercial and industrial space. Based on number of tenants, Public Storage is among the largest landlords in the world. Given its long and successful history, its presence in major markets, its customer focus and its leadership position in the self-storage industry, Public Storage is a respected and trusted operator of self-storage facilities. Public Storage is a member of the S&P 500 and FT Global 500. Common and preferred stock for Public Storage trade on the New York Stock Exchange. Public Storage is an American international self storage company headquartered in Glendale, California, that is run as a real estate investment trust (REIT). It is the largest brand of self-storage services in the US. In 2008, it was the largest of four publicly traded storage REITs. There are more than 2,200 Public Storage self-storage locations in the US, Canada and Europe. It also owns 42 percent of an office parks subsidiary, sells packing supplies, and provides other services. As a REIT, it is owned by real estate investors, who receive more than 90 percent of the company's profits as a return-on-investment. Public Storage Inc. was founded in 1972 by B. Wayne Hughes and Kenneth Volk Jr. It grew to 1,000 locations by 1989, using funding from investors in real estate limited partnerships (RELPs). The private company was re-structured as a publicly traded REIT in 1995, when Storage Equities merged with Public Storage and adopted its name. In 2006 it acquired Shurgard Storage Centers in a $5.5 billion transaction. Public Storage is a real estate investment trust (REIT). The Company's principal business activities include the ownership and operation of self-storage facilities, which offer storage spaces for lease, generally on a month-to-month basis, for personal and business use, ancillary activities, such as merchandise sales and tenant reinsurance to the tenants at its self-storage facilities, as well as the acquisition and development of additional self-storage space. The Company's segments include Self-Storage Operations, Ancillary Operations, Investment in PS Business Parks, Inc. (PSB) and Investment in Shurgard Europe. As of December 31, 2016, the Company had direct and indirect equity interests in 2,348 self-storage facilities (with approximately 154 million net rentable square feet) located in 38 states in the United States operating under the Public Storage name. Boston Properties, a self-administered and self-managed real estate investment trust (REIT), is one of the largest owners, managers and developers of Class A office properties in the United States, with a significant presence in five markets: Boston, Los Angeles, New York, San Francisco and Washington, DC. Boston Properties is a fully integrated real estate investment trust that develops, redevelops, acquires, manages, operates and owns a diverse portfolio of primarily Class A office space totaling approximately 48.4 million square feet and consisting of 164 office properties (including six properties under construction/redevelopment), five retail properties, five residential properties (including three properties under construction) and one hotel. Boston Properties is well-known for its in-house building management expertise and responsiveness to tenants’ needs. The Company holds a superior track record in developing premium Central Business District (CBD) office buildings, suburban office centers and build-to-suit projects for the U.S. government and a diverse array of creditworthy tenants. Boston Properties, Inc., a self-administered and self-managed American real estate investment trust (REIT), is one of the largest owners, managers and developers of Class A office properties in the United States, with a significant presence in five markets: Boston, Los Angeles, New York, San Francisco and Washington, DC. Boston Properties is a fully integrated real estate investment trust that develops, redevelops, acquires, manages, operates and owns a diverse portfolio of primarily Class A office space totaling 47.7 million square feet and consisting of 164 office properties (including six properties under construction), five retail properties, four residential properties (including two properties under construction) and one hotel. The company specializes in high-performance workspace and acquired several high-value properties in these markets, including the General Motors Building in New York City for US$2.8 billion, the highest paid for an American office building. It also owns one hotel property and is a member of REBNY. In 2005, it constructed 901 New York Avenue NW in Washington, D.C. in the Mount Vernon Square neighborhood seven blocks northeast of the White House. In October 2010, Boston Properties bought the John Hancock Tower and Garage from a partnership between Normandy Real Estate Partners & Five Mile Capital Partners for $930 million. Boston Properties, Inc. is a real estate investment trust. The Company is an owner and developer of office properties in the United States. Its segments by geographic area are Boston, New York, San Francisco and Washington, DC. Its segments by property type include Office, Residential and Hotel. As of December 31, 2016, the Company owned or had interests in 174 commercial real estate properties, aggregating approximately 47.7 million net rentable square feet of primarily Class A office properties, including eight properties under construction/redevelopment totaling approximately 4.0 million net rentable square feet. As of December 31, 2016, its properties consisted of 164 Office properties (including six properties under construction/redevelopment); one hotel; five retail properties, and four residential properties (including two under construction). Its tenant base includes sectors, such as media technology, legal services, government/public administration and retail. Essex’s beginnings go back to 1971, when real estate entrepreneur, George M. Marcus formed Essex Property Corporation. In 1994, with a portfolio of 16 multifamily communities located on the West Coast, the Company made its public debut as Essex Property Trust, Inc. (NYSE:ESS). Essex is a fully integrated real estate investment trust (REIT) that acquires, develops, redevelops, and manages multifamily apartment communities located in supply-constrained markets. The portfolio is concentrated in select coastal submarkets along the West Coast, including Southern California, Northern California, and the Seattle metropolitan area. Essex provides quality apartment homes with a commitment to a high standard of service for our residents. We offer a number of programs to enhance your stay at an Essex community. Essex Property Trust is a publicly-traded real estate investment trust that invests in apartments, primarily on the West Coast of the United States. As of December 31, 2016, the company owned interests in 245 apartment complexes, aggregating 59,645 apartment units, and 2 office buildings comprising 140,564 square feet. Essex Property Trust, Inc. is a self-administered and self-managed real estate investment trust. The Company is engaged primarily in the ownership, operation, management, acquisition, development and redevelopment of predominantly apartment communities, located along the West Coast. Its segments include Southern California, Northern California, Seattle Metro and Other real estate assets. The Company owns all of its interest in its real estate and other investments directly or indirectly through Essex Portfolio, L.P. (the Operating Partnership). Its properties include Mio, Form 15, Emerson Valley Village and Ashton Sherman Village. As of December 31, 2016, it owned or held an interest in 245 communities, aggregating 59,645 apartment homes, excluding its ownership in preferred equity investments, as well as two operating commercial buildings (totaling approximately 140,564 square feet), and six active development projects with 2,223 apartment homes in various stages of development. Digital Realty built the global standard for technical real estate, developing a unique capability to acquire, manage, and scale data center campuses. Now, Digital Realty is building a unique ecosystem of open solutions that power customer growth through exceptional service on a foundation of unrivaled data center expertise. The acquisition of Telx in October 2015 uniquely positioned us to provide a complete range of data center solutions on a global scale that best fit our customers’ needs. At the same time, we could connect you to the cloud and all the critical services, customers and partners that drive your business. Our strategic merger with Dupont Fabros Technology, now enables us to support an even greater portion of your IT lifecycle by expanding our ability to meet your data center needs, from single cabinet to multi-megawatt, up to hyperscale deployments around the globe. The data universe is growing exponentially every day and expected to continue over the coming years. This presents both tremendous business and technological challenges making data centers a key component of an IT leader’s strategy. Have you future-proofed your IT strategy? We have always been strategic in our expansion by looking ahead to markets with the potential to deliver you the greatest value. Doing so has helped us establish our unparalleled global footprint and enabled us to deliver comprehensive solutions when and where you need them. Our merger with Dupont Fabros Technologies now further expands our ability to meet your data center needs, from single cabinet to multi-megawatt, up to hyperscale deployments around the globe. As a global data center partner, we are trusted with the mission-critical architectures of some of the top companies in social media, financial services, and health care. Our industry-leading record of ten years of 5 nines ensures you’ll never go dark and that you can count on the security, reliability and agility required to support your high-performance networks. Digital Realty Trust, Inc. is a real estate investment trust (REIT). The Company is engaged in the business of owning, acquiring, developing and operating data centers. The Company is focused on providing data center and colocation solutions for domestic and international tenants across a range of industry verticals ranging from financial services, cloud and information technology services, to manufacturing, energy, healthcare and consumer products. As of December 31, 2016, its portfolio consisted of 145 operating properties, including 14 properties held as investments in unconsolidated joint ventures, of which 104 are located throughout the United States, 32 are located in Europe, four are located in Asia, three are located in Australia and two are located in Canada. It is a general partner of Digital Realty Trust, L.P. As of December 31, 2016, it owned an approximate 98.5% common general partnership interest in Digital Realty Trust, L.P.
Our mission at MAA is to deliver superior service and value for our residents, employees and shareholders. We refer to this as creating "A Brighter View" and we are doing it every day. In fact, we proudly display "Our Brighter View" plaques at every MAA office just to serve as a daily reminder of our focused mission. MAA is committed to remaining true to our rich tradition of service to each other, to our residents, and to our shareholders. We respect the privilege to providing value to those whose lives we touch. As of March 31, 2017, MAA owned or had ownership interest in 100,063 operating apartment homes in 304 communities in 17 states and the District of Columbia. Headquartered in Memphis, Tennessee, MAA is traded on the New York Stock Exchange under the symbol MAA and is included in the S&P 500. Mid-America Apartment Communities is a publicly-traded real estate investment trust based in Memphis, Tennessee that invests in apartments in the Southeastern United States and the Southwestern United States. As of December 31, 2016, the company owned 302 apartment communities containing 99,124 apartment units and 4 office properties containing 269,242 square feet. The company is the largest publicly-traded apartment real estate trust in the United States. Mid-America Apartment Communities, Inc. is a multifamily focused, self-administered and self-managed real estate investment trust (REIT). The Company owns, operates, acquires and develops apartment communities primarily located in the Southeast and Southwest regions of the United States. It operates through three segments: Large market same store, Secondary market same store and Non-Same Store and Other. Its Large market same store communities are communities in markets with a population of at least one million and at least 1% of the total public multifamily REIT units that it has owned. Its Secondary market same store communities are communities in markets with populations of more than one million but less than 1% of the total public multifamily REIT units or markets with populations of less than one million that it has owned. Its Non-same store communities and other includes recent acquisitions and communities in development or lease-up communities. Extra Space Storage (NYSE: EXR) is a US provider of self-storage units, with over 1,400 facilities across 38 states plus Washington, D.C. and Puerto Rico. Headquartered in Cottonwood Heights, Utah, Extra Space Storage is the second largest owner and/or operator of self-storage properties in the United States, as well as the largest self-storage management company. Extra Space Storage has been a publicly traded real estate investment trust (REIT) since 2004, and is traded on the New York Stock Exchange with the ticker symbol EXR. The company was founded in 1977 by Kenneth Woolley, who remains the chairman. Since 2017, Joseph D. Margolis has served as the company's CEO. Extra Space Storage Inc. is a self-administered and self-managed real estate investment trust (REIT). The Company owns, operates, manages, acquires, develops and redevelops self-storage properties located throughout the United States. The Company operates through three segments: rental operations; tenant reinsurance, and property management, acquisition and development. The Company's rental operations activities include rental operations of stores in which it has an ownership interest. The Tenant reinsurance activities include the reinsurance of risks relating to the loss of goods stored by tenants in its stores. The Company's property management, acquisition and development activities include managing, acquiring, developing and selling stores. The Company's interest in its stores is held through its operating partnership, Extra Space Storage LP (the Operating Partnership). Its primary assets are general partner and limited partner interests in the Operating Partnership. Federal Realty Investment Trust is a real estate investment trust that invests in shopping centers in the Northeastern United States, the Mid-Atlantic states, California, and South Florida. Federal Realty is a recognized leader in the ownership, operation and redevelopment of high-quality retail based properties located primarily in major coastal markets from Washington, D.C. to Boston as well as San Francisco and Los Angeles. Founded in 1962, our mission is to be the preeminent force in creating, operating, and re-imagining the most relevant retail and mixed use environments in the USA's largest markets that exceed the expectations of the communities they serve in every way while providing a superior return to our shareholders. Our expertise includes creating urban, mixed-use neighborhoods like Santana Row in San Jose, California, Pike & Rose in North Bethesda, Maryland and Assembly Row in Somerville, Massachusetts. These unique and vibrant environments that combine shopping, dining, living and working provide a destination experience valued by their respective communities. Federal Realty's 104 properties include over 2,800 tenants, in approximately 24 million square feet, and over 1,800 residential units. Federal Realty has paid quarterly dividends to its shareholders continuously since its founding in 1962, and has increased its dividend rate for 50 consecutive years, the longest record in the REIT industry. Federal Realty shares are traded on the NYSE under the symbol FRT. Federal Realty Investment Trust is an equity real estate investment trust (REIT). The Company specializes in the ownership, management and redevelopment of retail and mixed-use properties located primarily in affluent communities in selected metropolitan markets in the Northeast and Mid-Atlantic regions of the United States, as well as in California and South Florida. As of December 31, 2016, the Company owned or had an interest in community and neighborhood shopping centers and mixed-use properties, which operated as 96 retail real estate projects and included approximately 22.6 million square feet. As of December 31, 2016, its 96 retail shopping center and mixed-use properties were located in 12 states and the District of Columbia. As of December 31, 2016, there were approximately 2,900 leases with tenants providing a range of retail products and services. These tenants range from sole proprietorships to national retailers, or corporate group of tenants. Vornado Realty Trust is a preeminent owner, manager and developer of office and retail assetsVornado’s portfolio is concentrated in the nation’s key market — New York City — along with the premier asset in both Chicago and San Francisco. Vornado is also the real estate industry leader in sustainability policy. The company owns and manages over 19 million square feet of LEED certified buildings and received the Energy Star Partner of the Year Award, Sustained Excellence 2017. In 2012, Vornado commemorated 50 years on the NYSE. Vornado Realty Trust is a real estate investment trust based in New York City. The company invests in office buildings and street retail in Manhattan. Vornado Realty Trust is a real estate investment trust (REIT). The Company conducts its business through Vornado Realty L.P. (the Operating Partnership). The Company operates through two segments: New York and Washington, DC. As of December 31, 2016, the Company's New York segment consisted of 28.3 million square feet in 86 properties. Its properties include 1290 Avenue of the Americas, Two Penn Plaza, 770 Broadway and 90 Park Avenue. As of December 31, 2016, the Company's Washington, DC segment consisted of 58 properties aggregating 14.7 million square feet, including 11.1 million square feet of office space in 44 properties, nine residential properties containing 3,156 units and a hotel property. Its properties include 2001 Jefferson Davis Highway, 223 23rd Street, 2221 South Clark Street and 1700 M Street. The Company's interests in properties are held by the Operating Partnership. As of December 31, 2016, the Company owned the 3.7 million square foot Mart (theMart) in Chicago. Realty Income Corporation is a real estate investment trust that invests in shopping centers in the United States and Puerto Rico that are subject to NNN Leases. 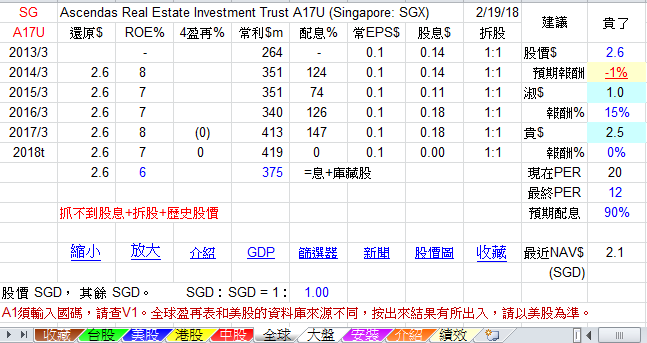 The company is one of a few real estate investment trusts that pays dividends monthly, rather than quarterly. To learn more Company Fast Facts, please see our printable fact sheet. Realty Income Corporation is a real estate investment trust (REIT). The Company is engaged in in-house acquisition, portfolio management, asset management, credit research, real estate research, legal, finance and accounting, information technology and capital markets capabilities. As of December 31, 2016, the Company owned a diversified portfolio of 4,944 properties located in 49 states and Puerto Rico, with over 83.0 million square feet of leasable space leased to 248 different commercial tenants doing business in 47 separate industries. As of December 31, 2016, of the 4,944 properties in the portfolio, 4,920, or 99.5%, were single-tenant properties, and the remaining were multi-tenant properties. As of December 31, 2016, of the 4,920 single-tenant properties, 4,836 were leased with a weighted average remaining lease term (excluding rights to extend a lease at the option of the tenant) of approximately 9.8 years. HCP, Inc. is a fully integrated real estate investment trust (REIT) that invests primarily in real estate serving the healthcare industry in the United States. HCP owns a large-scale portfolio diversified across life science, medical office and senior housing. Recognized as a global leader in sustainability, HCP has been a publicly-traded company since 1985 and was the first healthcare REIT selected to the S&P 500 index. HCP, Inc., formerly Healthcare Property Investors Inc., is a Real Estate Investment Trust, invests primarily in real estate serving the United States healthcare industry. In December 2016, Board of Directors elected Tom Herzog as Chief Executive Officer (CEO) and as a member of the Board. HCP's Board also elected Justin Hutchens as President. Both elections were effective as of January 2017. Tom Herzog previously served as Chief Financial Officer (CFO) since rejoining the HCP in June 2016, and also served as the HCP's CFO from 2009 to 2011. He will report to Mike McKee, HCP's Executive Chairman. Justin Hutchens will report to Mr. Herzog. HCP, Inc. is a self-administered real estate investment trust. The Company invests in real estate serving the healthcare industry in the United States. The Company's segments include senior housing triple-net (SH NNN), senior housing operating portfolio (SHOP), life science and medical office. Its senior housing facilities include independent living facilities, assisted living facilities, memory care facilities, care homes, and continuing care retirement communities. Its Life science properties contain laboratory and office space for biotechnology, medical device and pharmaceutical companies, scientific research institutions, government agencies and other organizations. Its Medical office buildings contain physicians' offices and examination rooms, and may include pharmacies, hospital ancillary service space and outpatient services. As of December 31, 2016, it had interests in and managed 15 hospitals, 61 care homes in the United Kingdom and five post-acute/skilled nursing facilities.